Who Really Benefits From Vouchers and Choice? We have come to the close of 2015, which means that we are getting set for the next legislative session in Tennessee. 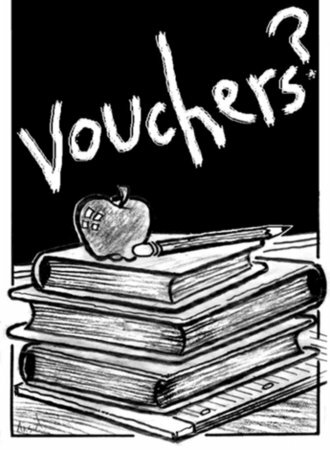 Once again, state legislators will attempt to pass a voucher bill. They’ll try this despite having failed at it during the last two sessions. As they drive to pass this legislation, you’ll hear phrases like “trapped in a failing school” and “zip code shouldn’t determine quality” bandied about, but don’t be fooled. Choice, as it relates to schools, is really all about abdication and deception. What legislators are saying when they push for choice bills is, “We can’t guarantee you quality schools and we are not willing to fund them to a level that is needed, so you try.” By putting the onus back on parents, it gives legislators an opportunity to abdicate their responsibility to provide and fund a quality education for all children. They can make the argument that they’ve empowered parents and given them money as deemed necessary by the state to educate each child. If that child is still trapped in a failing school, then whose fault is that? What parents don’t know but educators and legislators do know is that the current monetary allotment for schools is far from sufficient. Yet choice proponents expect parents to take that money and fund a quality education with it, succeeding where the state has purportedly failed. In essence, what legislators are doing here is putting the burden of making up the shortfall of money needed on the shoulders of parents. Parents will have to pay transportation costs, activity fees, and other intrinsic but not always apparent costs. Also as anybody who’s is a member of PTO can testify, pressure will only increase for parents to dig deeper into their pockets to make up any budgetary shortfalls. Do you believe for one minute that if vouchers are passed that the BEP will suddenly be increased and parents will receive the actual funding needed to ensure a quality education? Not if you look at the recommendations from this year’s Tennessee BEP Review Committee. It appears that the committee is trying to make the argument that additional funding is not necessary despite previous years’ recommendations. Fortunately, public education advocates and some parents are on to this little scam and have been trying to educate the public to this canard despite choice proponents’ best efforts. Legislators will also argue that the value of a choice bill lies in the fact that parents know best, which is bit of a deception. At the risk of being politically incorrect, this notion that parents are qualified to judge the quality of education their child receives has always been a bit of a head scratcher to me. To assume that because you are able to procreate, you suddenly become an expert on educating that child, to me, flies in the face of empirical evidence. Parents do know how to love and nurture their children, no doubt about that and they are often their child’s biggest advocate. But educating them in all the ways public schools do? Parent’s obviously should be involved in their child’s education but to empower them as primary decision makers is an abdication by legislators. Do they mean to say that having a kid translates to a parent suddenly grasping classroom management and pedagogy? Child development is no longer a mystery, and you suddenly have the time and means to keep up with current educational research? When does this miracle transpire? Is at conception or actual birth? This supposition of parents being equipped also ignores all the challenges parents face in their own daily lives. Every parent does not have the means to fully engage in their child’s education. Many are beset by both external and internal challenges that prevent them from fully investing. These include, but are not limited to economics, housing, and educational status. Are we supposed to also ignore all the case records at the Department of Child Services? Hmmm… it’s probably just a coincidence that many of our children who live in poverty and are struggling in school also have parents who suffer from mental illness, addiction issues, lack of education, incarceration, etc. But the concept of vouchers and school choice attempts to ignore all of that, and instead lift up ALL parents as a means of ensuring that ALL children are properly educated. The state is again saying, “Hey, we have empowered the noble parent to take care of this job, so what more do you want from us?” I say more, a lot more. Our founding fathers thought the role of education so important that the responsibility of educating children was written into most state constitutions. It’s time we hold legislators to the same level of accountability as they impose on educators. Parents, before you get too upset with me, don’t think politicians truly believe you know better either. If they did, they would make it a lot easier for parents to opt out out of testing. Instead they fight hard to make sure that you as a parent don’t decide which test your child takes and which they don’t. The truth is, where ever the money is, thats where you’ll find the advocates of choice and vouchers. Here is another part of the school choice process that always baffles me. When it comes to choosing the best school for little Johnny, how exactly does a parent do that? How does a parent identify that one school is necessarily better than another? Look at test scores? Not so effective. Visit the school? Pray, tell me how, in one visit or two visits, is a parent supposed to have any idea what really goes on in that school? If I show up to your work for a tour prearranged by your boss, am I going to get an accurate picture of your work place? Or am I just going to get a snap shot of an moment in an isolated day? Why should a school be any different? My children are still young, but I’ve already become aware that they live in two worlds. One that includes me and one that is exclusive to their teachers and peers. Their actions can be strikingly different in each world. Just because I look in on them and they appear happy and engaged does not mean that is the permanent state and vice versa. All a parent is getting on a visit to a school is a snapshot and one that is possibly staged. Furthermore, how many of us parents would truly recognize quality teaching from poor teaching? The art of observing a classroom and making meaningful deductions is considered difficult for professionals, yet we expect unschooled parents to make the distinction. Forgive me if I appear skeptical. I posed this question to a fellow parent who was out shopping for schools: what are you looking for to make your decision? She replied, an environment that seems to lend itself to my child’s learning style and will make them feel the most comfortable. Well, the most comfortable learning style for my kids lately is through their IPads. My son has utilized Kids YouTube to learn to draw, and my daughter is using it to learn about fashion and gymnastics. Should I just take the proposed voucher cash from the state, upgrade their IPads, and call it a day? After all, they are comfortable and they are learning, and the wife and I could use that money to travel. The unspoken element in this whole canard is that parents invariably will focus on test scores and word of mouth to make their decisions. Since poverty plays a large role in dictating test scores, you will see more parents, at least those that have the means, gravitate toward those schools in wealthier areas that are already considered so-called high performing schools. The result of this will result in increased pressure on our schools in high poverty areas. They will be forced to compete by increasing focus on test scores and marketing. It’s my opinion that this would prove disastrous to our educational system. Which makes it a dire threat to our society. It cannot be stressed enough, strong schools require strong communities. It would appear to me that the whole concept of vouchers is one that shifts blame from one body to another. Elected officials are applauded for empowering parents, yet parents are required to execute a task officials are abdicating. It also further fosters an us-against-them mentality. Parents are encouraged to focus on what’s best for their child and let others worry about all the other children, thus relieving society of the burden of educating all children. Then the mentality becomes if there is a so-called failing school, it’s not our fault. After all, we’ve got our kids in a good school and everybody has that same opportunity. Or do they? My theory is that this idea of school choice takes advantage of the inherent fear that all parents suffer from – the fear that they are not providing the best opportunities for their children. Parents are always a little unsure about how well their children’s school is serving them. Just this week-end a parent, who’s child is enrolled in a private school, remarked to me, “I think he’s doing well. I just wish I just knew if he was really performing on level with other kids.” Choice gives parents the opportunity to say, “We researched their school and toured it, so now we know it’s a good school.” But is it really? Or is it more about deciding who your child sits next to in that school? Do not for one minute think that vouchers will not further divide our society. We may not admit, but ignoring the side effects won’t prevent them from occurring. I work in the insurance industry and often say that insurance is more about making people able to sleep at night, because they feel that their families are protected, than it is about actually protecting them. You like to believe that the life insurance policy you bought will pay off in the event of tragedy, but we’ve all heard stories where policies didn’t pay or people didn’t make the best decisions about coverage, yet we don’t think about any of that when we purchase a policy. We accept that we are taking steps to protect our family and we leave it at that. School choice bears a remarkable similarity to buying life insurance. A parent may sleep better at night because of the choice they made, but is their child truly getting the best education? I’d argue that choice actually does more to make adults feel comfortable about schools and is less about benefiting kids. I also believe that its high past time that we take a closer look at what competition is truly doing to our children and if adult needs are actually having a negative impact on their future. The Tennessee legislative session starts in about a month. Please don’t allow legislators to sell you on the canard of school choice through vouchers. Instead, demand that they pass meaningful legislation that will benefit all children and not just let legislators off the hook. Demand that they fully fund the BEP. Demand that they address the issues that place so many of our children in poverty. We all need to demand that every child gets a school they deserve. In other words, we should stand and fight and not give in to flight. Choice and vouchers are a make money scheme not a plan to improve education. And parents will lose ALL parental authority which is part of the you scratch my back i’ll scratch your back scheme between the federal government and the people supporting choice and vouchers. I think it’s so eye-opening to look at it from the perspective that politicians are saying “We can’t guarantee you quality schools and we are not willing to fund them to a level that is needed”.